A part of my role here at Willow is designing and installing many large lighting rigs every year. With large-scale production like at Willow, lighting rigs can get very complicated very fast. In order to minimize unnecessary complications and maximize efficiency, I have developed a process to help prepare for and lead lighting load-ins for large events. 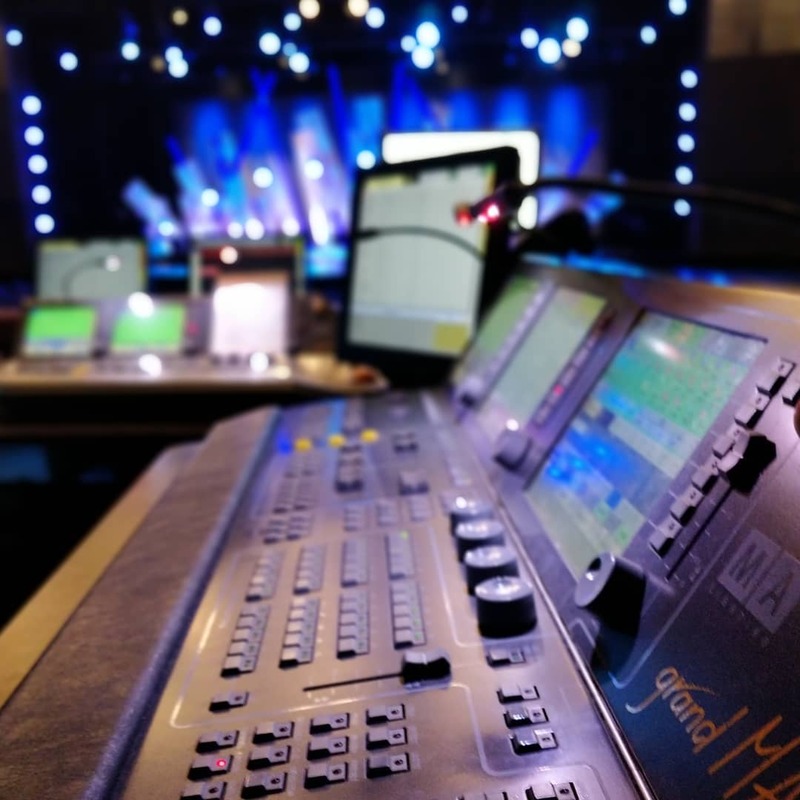 In the months leading up to a large event, I work alongside Willow’s lighting designer, Dan Larson, as he designs the look and feel of the lighting rig in line with the creative requirements of the event. We start out with big scale dreams and as the specific needs and requirements are determined, we scale back to what is within our reach. Once we know what we need to be able to fulfill the creative requirements, we start reaching out to rental companies to source any additional equipment needed – this is where the load in process really starts. Once the ball is rolling with selecting a vendor, the number of fixtures, and time frame for installation, it’s time to turn attention towards planning. Where do I need it and how much do I need? Adding an additional 200 amps of power required to run the rig is not always as easy as it sounds. Is there enough existing power in the right spots to support this or do I need to plan for additional power distribution to get the correct amount and correct voltage in the correct locations? I need to determine exact lengths of cables to send to the rental company to ensure when we get to load in we are not scrambling to get more cable because runs were too long for our quoted cable package. Do I have enough universes available? How am I going to get DMX to all of my lights? Do I need to add additional DMX nodes to get the correct universes to the lights? Can our 21-year-old GrandMA 1 lighting console actually run all this stuff? I need to make sure that our console has enough remaining attributes to control the additional requirements of the rig. If it doesn’t – do I need to look at renting network processing units to help handle the load? How long is this thing going to take to put together? Once everything is installed, how am I going to maintain it? If a light fails how can I repair or replace it? Before load in, I sit down with sometimes more than one large cup of coffee (preferably from Dunkin Donuts), the lighting plot, and blank spreadsheet and start inputting every excruciating detail I can think of. The end goal is to have every light I will be touching in this spreadsheet with the fixture type, fixture number, channel count, mode, universe, address, physical location, location of its power, location of its data, voltage type, wattage, amperage, power cable length, data cable length, and are the cables run to each fixture from our rental or from our stash. I use the CAD file of our room with the lighting plot in it (we use Cast’s WYSIWYG) to meticulously measure the length of each cable run I plan to make so I am as accurate as possible. Though I’m sure some would calculate this information just for fun, I’m doing it because I want to know that I have every single item I need, every cable, every 2-fer, and every coupler in my plan so that when my crew gets here we have all the tools needed to complete our install. I want to steward my resources to the best of my ability. If I forget a cable and we need to order more, I am wasting my crew’s time and I am wasting money. Once I have my master spreadsheet done, I make a few ancillary spreadsheets with information/requests to send to the rental company – cable needs, and fixture addresses. I then make a cable drop spreadsheet with a list of all the “home run” cable drops I will need to make so that on load in day I can have someone focus on getting power and data where they will need to be while others focus on hanging lights and doing the cable runs between fixtures. Next, I make a spreadsheet listing every pathport node I need to re-address in our system and what each port will need to be changed to. By this point, my coffee is wearing off and I normally take a break and finish the rest of the planning the next day. The next part of my process is to make an install version of the lighting plot. I take the lighting plot and make sure every fixture is correctly numbered and addressed in the system. I will then start writing notes on the plot – distances between fixtures, distances off center, things like that. So that when I print off the layout for install day, I have all the information I need to get the lights where they need to go. Once I’ve populated all important information on the plot, I draw all my cable runs on the plot so my crew can follow the power and data on the plot from source to destination. I do this in a different color for both power and data, and I note where data ports are sourced (either from a node or from the installed systems in the wall). At this point, I should have a mostly finished plot and I hopefully will have been forced to think about every nitty-gritty detail in the install process. All that is left is to get it ready to print. I like to print my plots out on a large format plotter and actually put most of the master spreadsheet I created earlier on one side as a hub for quick reference information. I print off both plan (overhead) and elevation (front) views on the same print as well as a large section for taking notes during the install process during load in. As an added bonus, I save it as a pdf and email it to everyone on my crew so that we walk in having familiarity with what we will be doing. At crew call on each load in day, my crew and I all huddle up around the plot and have a quick safety briefing. This brief meeting starts with safety: reminding the crew to be aware of potential unsafe situations while using rigging systems or moving gear, giving an overview of safe handling practices for the different rigging systems we are using, who point people are for operating systems, and any/all special details we need to keep in mind while working during the day. Next is the plot overview: addressing the goals of the day, and assigning tasks to each person on the crew. I find it helpful to have people work with a partner when possible. Work gets done faster and there is a social aspect that helps with everyone having a good time while working. The most important part of my job during load-ins is making sure everyone has direction. I make sure that I am constantly thinking of what the next task is for each person is once they are done with what they are doing. This helps keep the project on track, helps the crew feel useful, and helps us use our time efficiently. In addition to all of this, it is important to know your team well, communicate well with other crews working in the same space, and determine the best order of operations for the day. Knowing your team – I know some of my team are extremely detail oriented and do an amazing job of making cable runs look amazing. Some of my team prefer to do the heavy lifting. If someone doesn’t like heights as much, I will not task them with a full day of lift work or pulling cable on the high grid 80’ up in the air. If you task your team properly, they will be happier, more productive and you’ll end up with a better system quicker. Communication with the other Crews – Everyone on the install team, is aiming for the same goal, but from different perspectives. It is important to have quick check-ins with the other groups working to see what they need from the lighting crew, where they are going to be working, and in turn, inform them what would be helpful for my lighting install team. In our context, it isn’t uncommon for the scenic crew to still be finishing the set while lighting is loading in. Knowing where they will be and what their working time frame helps me plan accordingly. It is super important to have these conversations so everyone’s expectations are correct and we step on as few people’s toes as possible. Order of operation – Plan out the best way to do your install so you are not getting in your own way. If you need to have a lift somewhere to install a fixture, don’t put your fixtures on the floor under that point until after you have done your lift work. If you need to push cases back and forth somewhere, wait to run your cables in that section until the end of your process so you’ve got a clear path to move through. What do I do when plans change? Even the best-laid plan is sure to change once you start moving, so remember to be flexible if an easier way to execute arises, or a task can’t be done because a piece isn’t finished. Make sure that any changes you make to the plan are written down and updated in your documentation so if you need to go back and troubleshoot an issue you’ve got accurate information.